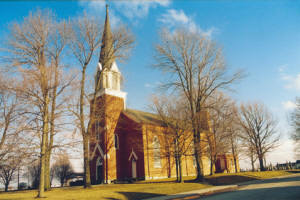 St. Paul Church is southeast of Ft. Recovery, located at the corner of Meiring Road and Sharpsburg Road. Archbishop John B. Purcell purchased the site of St. Paul’s Church in 1867 from Peter and Mary Ann Wourms for $100. In the spring of 1868, neighboring families met to make plans to build a church on the site. The pioneer families were: Peter Wourms, Henry Evers, Anthony Schwartz, John Timmerman, George Susbauer, Charles Schneider, Sebastian Klingshirn, John Schmitz, and John Detrick. In 1868, the land was cleared and Nicholas and John Laux built the new church at a cost of $1,000. The church measured 30 feet in length by 40 feet in width and 20 feet in height. The tiny bell tower contained two small bells. 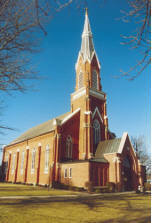 The church was dedicated in the summer of 1868 by Father Andrew Kunkler. The first pastor was Rev. Paul Reuter (1868-1870). For the first few years, Mass was celebrated every other Sunday. Several priests served the parish over the next twelve years and during the time of Rev. William Russ (1882-1890), it became apparent the church was unable to accommodate the growing congregation. There was discussion about building a new church and that ended on August 18, 1886 when lightning struck the church and destroyed much of it. 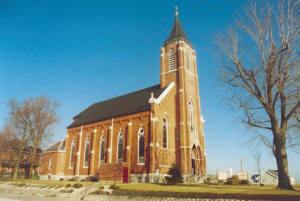 The new church was built at a cost of $8,000 and dedicated in 1889. 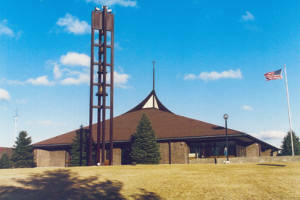 Various renovations have occurred over the years, including the addition of the CCD/Parish Hall in 1973. Changes that are more recent include tearing down the nearby school building and enlarging the parking lot. With the decline in the number of priests in the area and the need to cluster with other nearby parishes, it is the service of the parishioners that keeps St. Paul’s moving toward the future. This includes the clustering of Parishes in 2004 with: St. Peter, St. Joseph, St. Paul and Mary Help of Christians.